Divorce, or the dissolution of marriage, is the final termination of a marital union, cancelling the legal duties and responsibilities of marriage and dissolving the bonds of matrimony between the parties (unlike annulment, which declares the marriage null and void). Divorce laws vary considerably around the world, but in most countries it requires the sanction of a court or other authority in a legal process. The legal process of divorce may also involve issues of alimony (spousal support), child custody, child support, distribution of property, and division of debt. In most countries monogamy is required by law, so divorce allows each former partner to marry another; where polygyny is legal but polyandry is not, divorce allows the woman to marry a new husband. Like every major life change, divorce can be a stressful experience. It affects finances, living arrangements, household jobs, schedules and more. If the family includes children, they may be deeply affected. 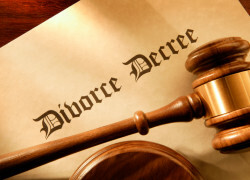 A number of countries have since the 1970s legislated to permit divorce, including Italy (1970), Portugal (1975), Spain (1981), Ireland (1996) and Malta (2011). Today, the only countries which do not allow divorce are the Philippines (though Muslims have the right to divorce) and the Vatican City, an ecclesiastical state, which has no procedure for divorce. “Divorcing one’s parents” is a term sometimes used to refer to emancipation of minors.